Beginning on Tuesday, the PSP will run a series of interviews with some of the growing number of alternative Union supporters groups. Here’s a quick preview of what to expect. Before there was the Union, there was the Sons of Ben. Before the Union had a staff, let alone a name or players on the pitch, the Sons of Ben were making the case for an MLS franchise in Philadelphia—and a name for themselves. They showed up at Philadelphia Kixx games. They showed up at New York Red Bulls games and the MLS Cup final between the New England Revolution and Houston Dynamo, catching the attention of the league, the media, and, most importantly, potential investors in a Philadelphia franchise. That, in the process, they humiliated supporters of the Red Bulls—”We’ve won as many cups as you, Metro, Metro. We’ve won as many cups as you, and we don’t have a team”—and the Revolution—”Buffalo Bills,” was simply the icing on the cake. The Sons of Ben continue to have the attention of the league. At the 2011 SuperDraft in Baltimore, league commissioner Dan Garber name checked them before the commencement of the draft at which the Sons of Ben were by far the largest contingent of support. They even outnumbered the supporters of nearby DC United, who were seated with the Red Bulls support on the other side of the auditorium despite the fact that the rivalry between the two dates back to the existence of the predecessors of the Red Bulls, the Metro Stars, and the start of league. Some may dispute the notion that, without the Sons of Ben, there would be no MLS in Philadelphia. But, it is undeniable that, without the Sons of Ben, there would be no Philadelphia Union. The Sons of Ben continue to grow and at present have over 5,000 members. 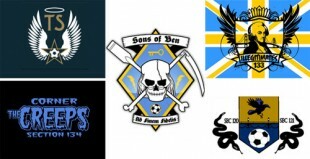 In the eyes of many—in Philadelphia and beyond—the Sons of Ben are the Union supporters group. And while it is true that they are the only group officially recognized by the club, it is also true that they are not the only Union supporters group. Perform a quick search of Facebook or forums like Big Soccer, and you’ll find many others. Some are simply informal section-based groups like Philadelphia Union Local 117, friends and strangers who have come to know one another because they sit in the same section at PPL Park. The activities of these groups are mostly informal efforts aimed toward organizing tailgating or simply keeping in touch. But, throughout the Union’s inaugural season and after, more serious alternative supporters groups also began to form. In addition to organizing tailgating and serving as forums for their members to keep in touch, these other supporters groups also typically have a Code of Conduct, proper websites, offer merchandise for sale such as t-shirts, and are often involved in organizing events outside of matchday, be they viewing or holiday parties or participating in charitable endeavors. While none of these groups view themselves as rivals to the Sons of Ben, they offer Union supporters interested in organized support alternatives to the Sons of Ben. The ranks of others, like the IllegitimateS, are filled with Sons of Ben members. But, rather than purchase season tickets in the River End, they choose to purchase tickets in section 133, an area reserved for traveling supporters. With the motto “Defend the Corner,” these supporters are not only interested in standing and chanting, they also want to make sure traveling supporters always understand that, while they are guests at PPL Park, they are not exactly welcomed. Others, like the Corner Creeps, do sit in the River End where, like their comrades in the IllegitimateS, they bring a distinctly punk rock (and tattooed) flavor to how they demonstrate their support. And, others still, like the Bridge Crew, want to utilize more positive, sportsman-like forms of support to create a more hospitable matchday experience for new and more casual Union fans, as well as providing an option for die hard fans who might find the more passionately boisterous style of other supporters groups not to their taste. All of these groups—some larger than others, some better organized than others—acknowledge an enormous debt of gratitude and inspiration to the Sons of Ben. None of these groups sees themselves as a rival to the Sons of Ben or any other Union supporters group, sharing a mutual respect and appreciation for each other and toward what each group wants to contribute to the matchday atmosphere at PPL Park. For, if PPL Park is to truly become a “Cathedral of Football,” the Sons of Ben will not be able to do it alone. The New York Red Bulls and DC United, long established in the league, each has three officially recognized supporters groups and probably dozens of unofficial groups between them. The Philadelphia Union supporters culture has plenty of room to grow. Whether any of the supporters groups you will read about over the next four days will become the next to be officially recognized by the Union remains to be seen. In fact, some of them don’t want to be officially recognized. But, official or not, each is making their own efforts to express their love and support of the Union in their own way. In doing so, each is the continuation of the work the Sons of Ben began four years ago. Tuesday: The Tammany Saints. Wednesday: The IllegitimateS. Thursday: The Corner Creeps. Friday: The Bridge Crew. I am glad that each of the groups has a unique flavor that makes it a distinctly different entity. I hope we never see an alternate group that competes with any other supporters’ group. I am thankful that there are no Ultras or Hooigans in these names. They, like the SoB; are original!